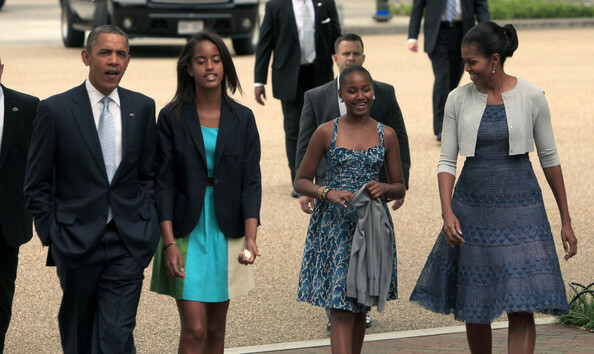 (AFP OUT) (L-R) U.S. President Barack Obama, Malia Obama, Sasha Obama, and first lady Michelle Obama walk from the White House to St. John's Episcopal Church August 19, 2012 in Washington, DC. Obama is embroiled in an election race with Republican presidential candidate, former Massachusetts Gov. Mitt Romney. Sasha Obama attended Sunday service looking summery in a blue sundress. Michelle Obama went to Sunday service wearing a white shrug sweater over a fit-and-flare dress.